Auto accident injuries range from whiplash to spinal injuries to death. It can be extremely difficult to get full compensation for your injuries. Payment for the damage done to your vehicle may be the least of your concerns. Even a whiplash injury that seems minor could result in a serious brain injury requiring years of rehabilitation — and resulting financial challenges. Your insurance settlement should cover all of your injuries, not just the medical expenses you have already paid. If you have been involved in a car, truck or other automobile accident, it is critical that you seek both medical attention and the advice of an experienced and resolute motor vehicle accident lawyer, even if you have received an enticing settlement offer from your insurance company. If you or a loved one has been injured in an auto accident, contact our Eagan, MN, law firm at 651-JUSTICE (651-587-8423) to schedule a free initial consultation. Every year in Minnesota, tens of thousands of accidents result in thousands of injuries and hundreds of deaths. Many of these injuries are caused by negligent drivers — the inattentive, the reckless and the impaired. Whether your accident was caused by another driver or an auto part defect, we can help you. At Bennerotte & Associates, P.A., we hold negligent parties accountable and pursue the maximum compensation you are entitled to. Minnesota is a No-Fault insurance state, but insurance settlements often do not fully cover your medical bills and rehabilitation; lost wages and future earnings; or potential in-home care, disability, loss of companionship, loss of consortium and funeral costs. We also provide experienced representation when individuals are injured in car accidents while working. Did a negligent driver run into your commercial truck or cause an accident while you were delivering pizza? Did a defective auto part cause your workplace accident? You may have a third-party liability claim against the negligent party in addition to your claim for workers' compensation. Many Minnesota accident lawyers do not handle workers' compensation claims because they involve a unique set of laws. They end up referring these cases to other attorneys, requiring their clients to work with two separate law firms. 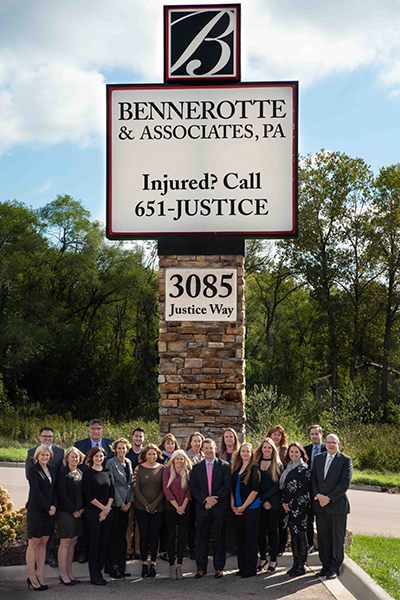 At Bennerotte & Associates, P.A., we will handle all aspects of your case with a goal to get you maximum compensation for your injuries. Time is of the essence in any personal injury situation. It is important for us to preserve and collect evidence in a timely manner. Witness testimony should be obtained while the incident is fresh in witnesses' minds. You have more options than insurance adjusters tell you about. We will work to ensure that all available compensation under the law is obtained for your recovery. No-Fault insurance is supposed to cover your medical bills and car repairs, but that doesn't mean all of your costs will be covered in a timely manner or over the long term. Our Minnesota injury lawyers know the local laws and how to get what you need when you need it. For more information, please visit our car accident FAQs. Death: Surviving family members may bring a wrongful death claim against at-fault parties. Bodily disfigurement: From a scar to a broken bone, you can bring an injury claim for an injury to your appearance or an impairment. Permanent disability: When it is reasonably certain you will not fully recover from your injury/injuries, you can submit a claim for permanent disability. This claim requires documentation from medical providers. Sixty-day disability: Inability to engage in substantially all of your usual and customary daily activities for 60 days or more. The 60 days do not have to be consecutive. Medical expenses of more than $4,000, not including diagnostic work. Call our Eagan auto accident attorneys as soon as possible to discuss your claim, how Minnesota law applies to your specific situation, and your options for moving forward. We provide straightforward legal counsel, fully investigate the accident, collaborate with medical and economic experts, and handle all aspects of the insurance claim on your behalf. Contact us today at 651-JUSTICE (651-587-8423). We CAN help. Do not make the mistake of signing anything or agreeing to any payment until an experienced lawyer who is looking out for your interests has reviewed your case. Call 651-587-8423 or contact us online today.